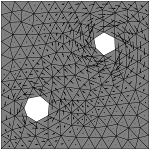 Algebraic multigrid methods for large, sparse linear systems are a necessity in many computational simulations, yet parallel algorithms for such solvers are generally decomposed into coarse-grained tasks suitable for distributed computers with traditional processing cores. However, accelerating multigrid on massively parallel throughput-oriented processors, such as the GPU, demandsalgorithms with abundant fine-grained parallelism. In this paper, we develop a parallel algebraic multigrid method which exposes substantial fine-grained parallelism in both the construction of the multigrid hierarchy as well as the cycling or solve stage. Our algorithms are expressed in terms of scalable parallel primitives that are efficiently implemented on the GPU. 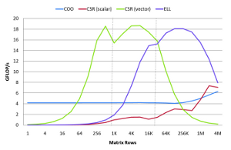 The resulting solver achieves an average speedup of 1.8× in the setup phase and 5.7× in the cycling phase when compared to a representative CPU implementation. This paper describes the algorithms, features and implementation of PyDEC, a Python library for computations related to the discretization of exterior calculus. PyDEC facilitates inquiry into both physical problems on manifolds as well as purely topological problems on abstract complexes. We describe efficient algorithms for constructing the operators and objects that arise in discrete exterior calculus, lowest order finite element exterior calculus and in related topological problems. Our algorithms are formulated in terms of high-level matrix operations which extend to arbitrary dimension. As a result, our implementations map well to the facilities of numerical libraries such as NumPy and SciPy. The availability of such libraries makes Python suitable for prototyping numerical methods. We demonstrate how PyDEC is used to solve physical and topological problems through several concise examples. This chapter summarizes recent work on the development of highperformance multicore and accelerator-based implementations of sparse matrix-vector multiplication (SpMV). As an object of study, SpMV is an interesting computation for at least two reasons. First, it appears widely in applications in scientific and engineering computing, nancial and economic modeling, and information retrieval, among others, and is therefore of great practical interest. Secondly, it is both simple to describe but challenging to implement well, since its performance is limited by a variety of factors, including low computational intensity, potentially highly irregular memory access behavior, and a strong input-dependence that be known only at run-time. Thus, we believe SpMV both practically important as well as insightful for understanding the algorithmic and implementation principles necessary to making eff ective use of state-of-the-art systems. Sparse matrix-vector multiplication (SpMV) is of singular importance in sparse linear algebra. In contrast to the uniform regularity of dense linear algebra, sparse operations encounter a broad spectrum of matrices ranging from the regular to the highly irregular. Harnessing the tremendous potential of throughput-oriented processors for sparse operations requires that we expose substantial fine-grained parallelism and impose sufficient regularity on execution paths and memory access patterns. We explore SpMV methods that are well-suited to throughput-oriented architectures like the GPU and which exploit several common sparsity classes. The techniques we propose are efficient, successfully utilizing large percentages of peak bandwidth. Furthermore, they deliver excellent total throughput, averaging 16 GFLOP/s and 10 GFLOP/s in double precision for structured grid and unstructured mesh matrices, respectively, on a GeForce GTX 285. This is roughly 2.8 times the throughput previously achieved on Cell BE and more than 10 times that of a quad-core Intel Clovertown system. 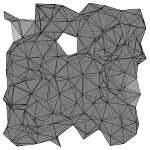 In this paper, we present a multigrid technique for efficiently deforming large surface and volume meshes. We show that a previous least-squares formulation for distortion minimization reduces to a Laplacian system on a general graph structure for which we derive an analytic expression. We then describe an efficient multigrid algorithm for solving the relevant equations. Here we develop novel prolongation and restriction operators used in the multigrid cycles. Combined with a simple but effective graph coarsening strategy, our algorithm can outperform other multigrid solvers and the factorization stage of direct solvers in both time and memory costs for large meshes. It is demonstrated that our solver can trade off accuracy for speed to achieve greater interactivity, which is attractive for manipulating large meshes. Our multigrid solver is particularly well suited for a mesh editing environment which does not permit extensive precomputation. Experimental evidence of these advantages is provided on a number of meshes with a wide range of size. With our mesh deformation solver, we also successfully demonstrate that visually appealing mesh animations can be generated from both motion capture data and a single base mesh even when they are inconsistent.